When the workload begins to pile up, employees tend to take shortcuts or neglect tasks that can ultimately help them. Stacks of unsorted papers, pens and pads scattered across the desk, and an inability to multitask. Keep in mind that some employees thrive in this seemingly chaotic environment, though. It may look like a disaster zone to you, but your employee may simply have an unorthodox organizational system. If they are normally well organized but have recently begun losing items and productivity, then you may have a problem. Subtle changes in a person’s behavior are hard to notice if you don’t know the signs. Some people are quiet but then get loud when they are stressed. Others will stop talking or laughing social functions at work. If they are up against a deadline, they may spend more time than usual at their desk during breaks, but this alone is not a red flag. Look for mood swings, extended fatigue, and social detachment. These changes are most obvious in your more outgoing employees. For your quieter, independent workers, look for signs of increased irritability and loss of emotional control. Although stress starts as a mental issue, it doesn’t stay that way for very long. Stress takes a hard toll on the body as fatigue and illness begin to develop. It reduces the body’s ability to fight off infections and heal. Many stressed employees will continue to come to work even when they are sick, or will work equally long hours at home when they should be taking time off to rest. 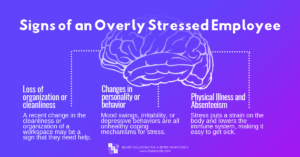 These employees may or may not understand that stress is the cause of the illness and will eventually burn out. 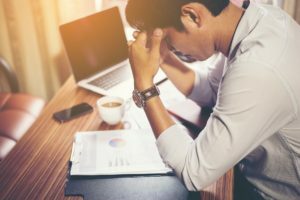 On the other hand, some other employees will experience frequent fatigue so severe that they are unable to get out of bed to come to work, using up personal and sick days quickly. 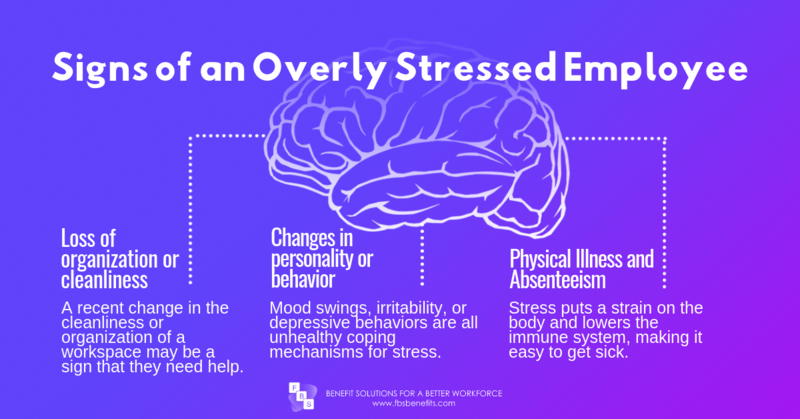 Be aware that if you have one employee showing signs of stress, you probably have a few more that you haven’t noticed yet. Create an “open-door” policy about workload and other professional matters. Employees should feel comfortable talking to you about projects and their ability to complete them. Have regular check-ins with your employees about their individual workflow and deadlines. Be willing to bring on new or temporary staff to help when the workload begins to outpace your workforce. Include an Employee Assistance Program (EAP) in your employee benefits line-up that provides counseling and work-life-balance tools. If your company is looking for ways to reduce workplace stress or is interested in an EAP, contact one of our benefit consultants to learn more. Next The “New” AHPs: Hot or Not?